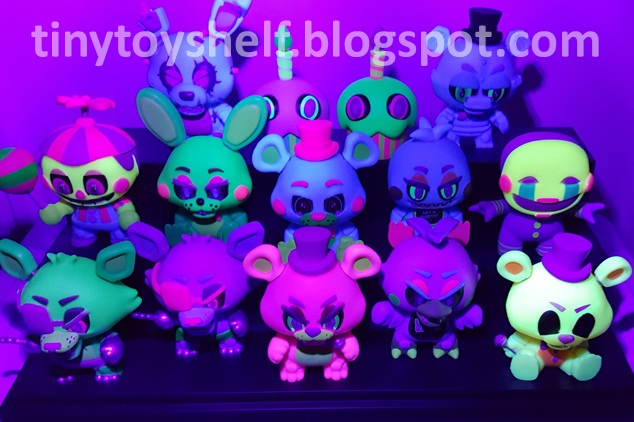 Gamestop is now listing (with images) Blacklight themed FNaF Mystery Mini Plushes and Figures (reddit alerted me to this). Personally, I kind of like some of them. Chica and the totally-not-based-on-Fredbear Golden Freddy are my favorites so far. I am sure we'll hear more in the coming days and have higher quality images. Also, just for clarification, I dont think these are exclusive to Gamestop. They are just the first ones to be listing them. 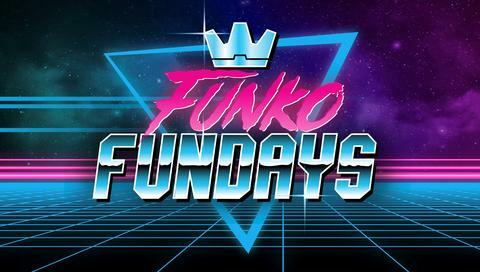 Please also note that there were also leaks of a FFPS MM series with exclusives at Gamestop and Target, so the Blacklight may not be all thats in store for us. Oh sweet thanks for sharing! The minis look pretty cool. Do they glow too? Or is it just colored? RBlue30 wrote: Oh sweet thanks for sharing! The minis look pretty cool. Do they glow too? Or is it just colored? Good question. This will be my first blacklight merchandise. Based on my undeestanding they glow undee blacklight but not in the dark. Not 100% on that though. So I Have one of the Freddy Funko Black-light Vinyl figures and I can confirm they only glow under a black-light. no way!! thats awesome! ill will be trying to get a set of these! Hm, according to Gamestop.com they should be out by now. Has anyone seem them in stores or pictures online? Same on checking weekly. I noticed yesterday Gamestop.com updated the release date to Nov. 1st so hopefully theyll get them next week! The FFPS MM were supposed to be releaed around the same time, but the FFPS plushes are listed to come out late Nov. so maybe all the dates are being pushed back? Thanks for the info and you're right about the Nov 1st situation. I actually checked with my gamestop today and they too said the minis are expected to arrive to their warehouse around the 1st of Nov and assuming that happens they should have them in store 3-5 days later. I guess at this point it's just a wait and see thing. It looks like they are very slowly getting out there. A few ThinkGeek and Gamestop stores are getting them based on online pics. Nothing near me yet. The ratios are 1/12 with Toy Chica, Endoskeleton, and Cupcake (Purple) being 1/36 based on the back of boxes (for the vinyl figures). Havent seen any ratios on the plush blind bags. Boymom4 wrote: Thanks for the info and you're right about the Nov 1st situation. I actually checked with my gamestop today and they too said the minis are expected to arrive to their warehouse around the 1st of Nov and assuming that happens they should have them in store 3-5 days later. I guess at this point it's just a wait and see thing. Nice, thanks too! I bet right when the 1st hits theyll show up in a lot of stores overnight! I cant wait! ShyGuyPal wrote: It looks like they are very slowly getting out there. A few ThinkGeek and Gamestop stores are getting them based on online pics. Nothing near me yet. The ratios are 1/12 with Toy Chica, Endoskeleton, and Cupcake (Purple) being 1/36 based on the back of boxes (for the vinyl figures). Havent seen any ratios on the plush blind bags. My local gamestop has these in. I found these at Game Stop last night. I wasn't impressed! I spoke too soon, found them at a Gamestop abit out of town! Edit: Okay last edit I promise. I like them better than the Glow series we had. 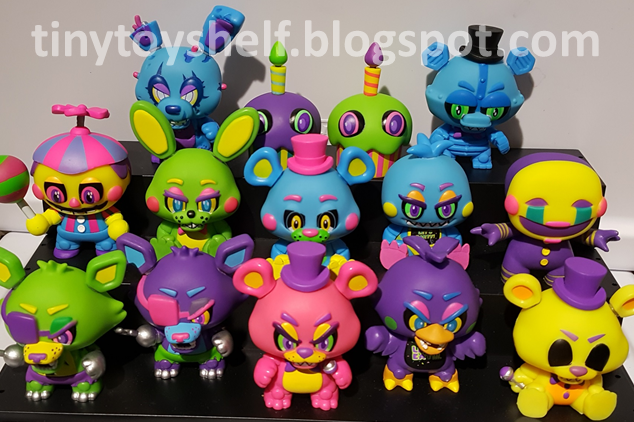 I would honestly like to see a Pink Bonnie (like the action figure), Blue Freddy (like the plush), and Yellow Cupcake (like the POP) Mystery mini to kind of round it off (ignoring the mini plushes). I have a feeling these will grow on people. They feel like something out of an 80's/90's arcade. ShyGuyPal wrote: I spoke too soon, found them at a Gamestop abit out of town! Oh sweet! Thanks for sharing! My GameStop doesn’t allow people to use scales so I’ll be trying with the layouts. Thanks!!! RBlue30 wrote: Oh sweet! Thanks for sharing! My GameStop doesn’t allow people to use scales so I’ll be trying with the layouts. Thanks!!! Of course, best of luck! I found them at another Gamestop and can verify it was the same layout there with the 1/36 being in the same place. I got a few more to replace the ones that I got with the QC issues mentioned. The new ones I got didnt have any issues though, must have just got unlucky in that case. And I pulled the Purple Cupcake too, so happy! I didnt weigh it, but I can assume it weighs nearly the same as the Green one (very light)! Quick update: Toy Chica (Blue) was around 41 something grams. Also, it looks like FFPS may not be coming out till mid January 2019, although they may be announced sooner. I hope they don't come out during Christmas time. ShyGuyPal wrote: Quick update: Toy Chica (Blue) was around 41 something grams. Thanks again for sharing! Did you happen to complete the set? RBlue30 wrote: Thanks again for sharing! Did you happen to complete the set? No problem! Yes! it surprised me how easy it was to find full cases at stores when they released. I think only one or two Gamestop stores near me didnt get them in. It seems like they are only being sold at Gamestop, FYE, and ThinkGeek. I havent seen them elsewhere at least. Oh nice! Congrats!!! Do you happen to have pictures of the full set together? I’d love to see! RBlue30 wrote: Oh nice! Congrats!!! 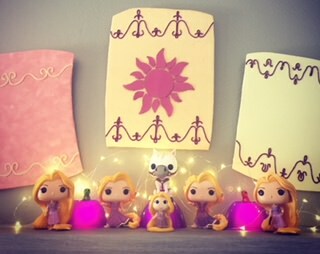 Do you happen to have pictures of the full set together? I’d love to see! These are pretty cool. I dont think i have ever seen these in person. Oh dude that’s sweet! Thanks for both pictures! I was able to get the ones I wanted. There’s a GameStop near me with a mostly full case so I’m hoping they’ll be discounted soon! Then hopefully I’ll be done! But congrats! They look awesome all together!